Making money magically appear always astonishes the audience. Thanks to the creative minds of João Miranda and Julio Montoro, that classic is now better than ever! In this illusion, the magician shows a pad, and sketches a bill. Suddenly the drawing VISIBLY jumps out of the pad, transforming into real money! Comes with enough material for 3 different bills, so you can vary the performance. The illusion is extremely easy to perform, and is always guaranteed to get an amazing reaction from the audience. 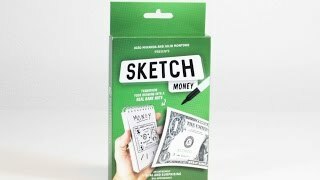 Mystify and excite your audience with Sketch Money - they've never seen anything like it! TV rights are included with the purchase. Make money appear from a drawing! Your spectators will freak out with this amazing visual illusion.